You are here : Home \\ Blog || Short Sale Articles \\ Can I Do a Short Sale If I Have a Home Equity Line of Credit (HELOC) or a 2nd Mortgage? Can I Do a Short Sale If I Have a Home Equity Line of Credit (HELOC) or a 2nd Mortgage? Can I Do a Short Sale If I Have a Home Equity Line of Credit (HELOC) or a 2nd Mortgage? Absolutely, but the 2nd lender, whether a Home Equity Line of Credit or a Fixed 2nd Mortgage, must also approve the short sale. In this case we must submit a short sale package to the 1st lender and the 2nd lender and both must approve the short sale. When we begin the short sale submission, we offer the 2nd lender a fixed amount of money to approve the short sale. The money comes from the proceeds of the sale, and the 1st lender must approve the 2nd lender receiving these funds. Mr. and Mrs. Smith have a home worth $200K. They owe $225K on their 1st loan and $30K on their 2nd loan and they want to sell. Our title company prepares a HUD 1 (settlement statement) that shows $3,000 of the proceeds of the sale going to the 2nd lender. If approved by the first lender, the 2nd lender will receive this $3,000 from the proceeds. Keep in mind that if The Smiths’ had not attempted a short sale and walked away from the property, the 2nd lender would get nothing. In some cases the 2nd lender will accept the $3,000 payout and approve the short sale. In other cases the 2nd lender would accept the $3,000, but ask the seller for an additional contribution. 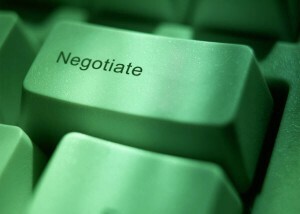 This process of asking the seller for money is all subject to negotiation. We help negotiate this for you. Keep in mind that since 1st liens always have priority over 2nd liens, any monies paid to the 2nd must be approved by the 1st lender. That can get tricky in some cases but again comes down to successfully negotiating a transaction to the close. Obviously there are a lot of factors that impact the 2nd lender’s approval, including the amount of the 2nd, how far delinquent it is, the hardship of the seller, the finanical status of the seller, whether the account has been sent to collections, and more. If you have questions on how your situation might play out, please contact us. We can talk more about structuring a plan of action to get your home sold. Previous post: How Long Does a Short Sale Take? Navigation: Weblog / Blog article: Can I Do a Short Sale If I Have a Home Equity Line of Credit (HELOC) or a 2nd Mortgage?